Quick as a slice, the majesty of Face Off concentrated into a pure adrenaline game of bluff and strategy. Ever since we saw our first ninja movies in the 80s we’ve all been wondering –Cowboy’s or Ninjas? On the one hand Cowboys have their trusty six shooters and faithful horses to help them. On the other hand, Ninja are well versed in the dark arts, possess secret knowledge and skills, and have no qualms about murdering you in your sleep if they think they might lose the show down at sun down. In Face Off Duels you are installed as the leader of one of these mighty factions and over three rounds of tactical combat you get to figure out which group, which leader, is the greatest of all time. What separates Face Off Duels from other fighting card games is a unique scoring system that forces players to not only play their opponent, but the board as well. The result is a quick game that, like a great puzzle, you will want to return to again and again. 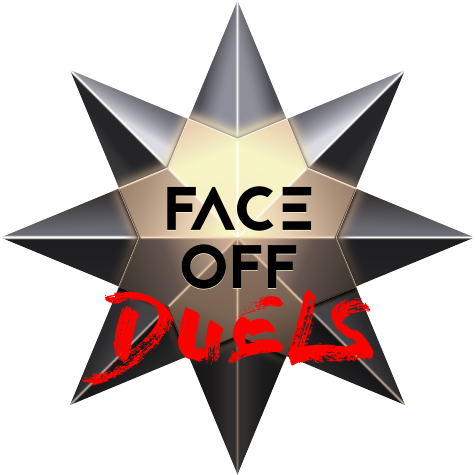 The Face Off scoring system plus the magical whimsy that is the Power Deck means no two games of Face Off Duels are the same. Face Off Duels present you with multiple paths to victory, a myriad of strategic options, and a sense of humor that is way more engaging than this blurb. In order to win, you must be able to plan ahead, bluff when appropriate, and occasionally pull that one card off the top of the deck. If you can do all these (and add seven plus five in your head) you just might be able to lead your chosen faction to glory.